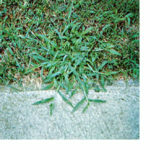 Crabgrass control is included in Liqui-Lawn’s Early Spring application. A pre-emergent herbicide applied to the lawn prevents successful growth of annual crabgrass. Annual crabgrass requires a sunny location and does not tolerate competition from dense, actively growing turf grass. Keeping the lawn well-watered, correctly mowed at 2 1/2 – 3 inches and healthy, by properly fertilizing, helps ensure crabgrass control. When a pre-emergent herbicide was not applied in early spring, a post-emergent herbicide can be used to help control young crabgrass weeds. Prevention and proper lawn maintenance that promotes good competition is the best control. Liqui-Lawn offers free service calls should a problem arise when using our complete, 5 Step Lawn Care Program.